Talk about real-world special effects: NASA has just released stunning video of a “coronal rain,” a solar phenomenon in which hot plasma appears to rain down in great arches onto the surface of the sun. 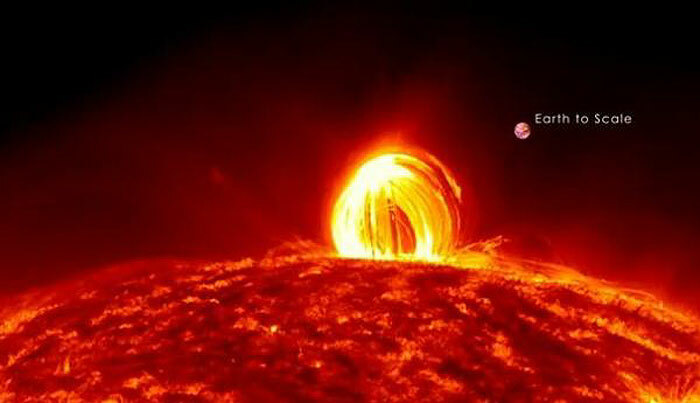 What you see in the video is actually three types of eruptive events: A solar flare — a sudden eruption that causes a flash of electromagnetic radiation and light; a coronal mass ejection (CME), which is when the sun sends some of its matter shooting out into space; and finally, the dazzling coronal rain that occurs when the super hot plasma that rose into the sun’s atmosphere begins to cool and trace strong magnetic fields back to the surface of the sun. Solar flares, CMEs and even coronal rains are not so unusual, said Alex Young, a solar astrophysicist at NASA Goddard Space Flight Center. But it wasn’t until 2010, when the Solar Dynamic Observatory was launched into orbit, that it was possible to see the sun in this kind of detail. To get the images for this video, which were collected in July 2012, the SDO sent back one 4,096 pixels-by-4,096 pixels frame every 12 seconds. Each second of this video corresponds to six minutes of real-time, so what has been condensed into a four-minute video actually unfolded over the course of several hours. And here’s one more detail to blow your mind: Check out this screen grab from the video, which gives you a sense of just how massive our sun and its phenomena actually are.